THE INVITATION came early, considering that the students are just in sixth and seventh grades, and it came from a distant place where winter means snow, not the T-shirt warmth of Kalihi. But hands shot up across the room when officials from three prominent universities swung by Dole Middle School this month to ask if 60 Kalihi kids would like to come to college in upstate New York. "Just the raising of the hands -- from us in this area, that is a big thing," said Dole Principal Myron Monte, cradling a ukulele after joining his students in a musical welcome. "We want to plant the desire early enough so that in their dreams, our students see themselves as a college graduate." 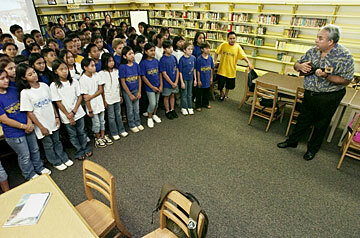 Dole Middle School Principal Myron Monte led sixth- and seventh-grade students in a song in the library. The students are participants in the Foundation for Excellent Schools' Century Program, which helps children in public schools more toward the goal of attending college. National data shows that Hawaii students graduate from high school at roughly the same rate as their counterparts elsewhere, but falter afterward. For every 100 public school students in ninth grade, 65 students graduate four years later, 34 go straight to college after graduation, and just 12 earn a bachelor's degree within six years or an associate's degree in three. The national average is not much better, with 18 students out of 100 making it through college in that time span, according to an analysis of the "educational pipeline" by the National Center for Public Policy and Higher Education published in 2004. Hawaii placed ahead of only Nevada and New Mexico and tied with Alaska and Alabama. The state Department of Education considers Hawaii's high school graduation rate much higher, at 80 percent, based on tracking students over time. The national study instead calculated its rate by dividing the number of public high school graduates in each state by the number of ninth graders four years earlier. Middle school may seem early to start thinking about college, but it can be a key time to get kids on track. The visitors to Dole Middle School came from Cornell University, Skidmore College and the State University of New York as part of The Century Program of the Foundation for Excellent Schools, which works to motivate students in high-need communities to succeed beyond high school. "Before I never thought of going to college, but when I went to this program, I really wanted to go," said Malori Nakoa, a Century Program scholar in seventh grade at Dole. "I want to be a chef or a computer technologist." To succeed in college, students need a solid academic foundation, as well as encouragement, information and financial support, experts say. Several nonprofits have teamed with the public schools and the University of Hawaii to offer a series of workshops for "College Awareness Month." "It's important to begin thinking about college early because the academic preparation for college begins in middle school," said Tammi Chun, project director for GEAR UP Hawaii, which works to increase college access for low-income students. "The courses you take and the habits you develop in middle school determine what courses you can take in high school." Dole Middle School Principal Myron Monte spoke with Dr. Steve Light, Monica Minor and Mary Breyette Almon during a visit to the school. The group was visiting on behalf of the Foundation of Excellent Schools' Century Program, which encourages children from public schools to pursue higher education. Many students simply assume they can't afford college and don't bother to pursue it. Early preparation can give them access to more scholarships and financial aid, Chun said. "There is a lot of aid available, you just need to jump through some hoops and apply for it," she said. In other cases, procrastination is the problem. Eunice Fukunaga, college counselor at Waipahu High School said many students don't think about college until their senior year. "I have seniors who still haven't come to see me and it's January," she added. "I have seniors who graduated last year that are still calling me." She makes presentations to all grades, but "unless they're seniors, a lot of what I say goes in one ear and out the other." "They see graduation as so far away and college as so far away that they don't have to worry about it," she said. "Come their senior year, it's too late. They can't go back and take the necessary courses." Over the next month, free college planning workshops are being held across the state, covering high school preparation, selection, scholarships and financial aid. College Goal Sunday on Jan. 29 gives Hawaii students a jump start on the financial aid application process. "Don't rule out a school or an opportunity before you see what's out there," said Monica Minor, director of the higher education opportunity program at Skidmore College. "Colleges and universities need students, a variety of students who are interested in everything. Financial aid makes it possible." Talk about the future: Talk to your children about what they'd like to do after high school. 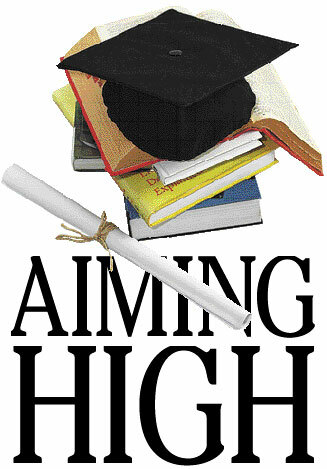 Encourage them to take challenging courses in high school. Find out what course work is needed to graduate and go to college. Make homework a priority: Show your children that you care about education and homework. Give them a regular time and place for homework, where they can focus without distractions. Go to school yourself: Meet your children's teachers and counselors. Attend school programs. Don't wait for the school to get in touch with you or for problems to crop up. Use time well after school: Take advantage of tutoring if it's available. Help your children explore their interests by signing up for other programs after school or on weekends in the summer. Read: Subscribe to a news magazine instead of another cable station. Take your family to the library and choose books for yourself as well as your kids. Play tourist: When you're traveling, stop by college campuses. Call to see if you can take a public tour. Learn how to fill out the federal financial aid application for college. Come with your parents and their 2005 income and tax information. Find out how to get financial aid for college at free workshops sponsored by the Pacific Financial Aid Association. » Nanakuli High School, Tuesday, 6 p.m.
» Waianae High School, Wednesday, 6:30 p.m.
» Kalani High School: Thursday, 7 p.m.
» Education Laboratory School, Jan. 31, 7 p.m.
Students and parents are invited to these free workshops to learn about college admission and how to find and apply for scholarships. » Keaau High School Cafeteria, Feb. 16, 6:30 p.m.
» Nanakuli High School Cafeteria, Feb. 21, 6:30 p.m.
» Farrington High School Cafeteria, Feb. 22, 6:30 p.m.